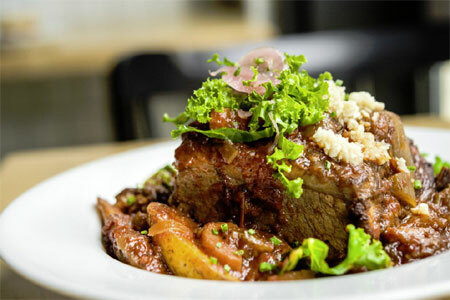 An operatic palazzo of Italian gastronomy in the Meatpacking District. 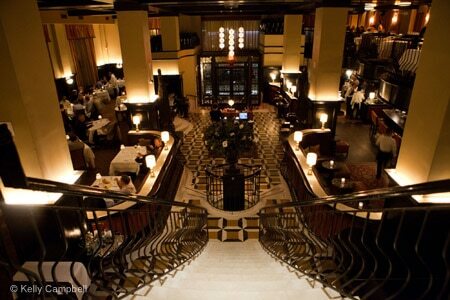 : Del Posto is an operatic palazzo of Italian gastronomy. A sweeping marble staircase dominates the sprawling, bi-level space, also marked by terrazzo floors, wrought-iron balconies, and the tinkling of live piano music. Only tasting menus are available; choose from five or eight courses for dinner, while lunch is three courses (there's also a vegan tasting menu). Antipasti include an herb and lettuce salad with Del Posto truffled dressing and crudo of the day. Pastas are the true arias in this production, from the slick spaghetti with crab meat and piquant jalapeño to the potato gnocchi with smoked cod collar and caviar. Among the little parcels of meats are veal roulade with chestnuts and sauce Rossini, and Moorish spiced lamb with labneh and crispy lamb neck. Finish with the just sweet enough pistachio semifreddo, or ricotta and lemon cake with black pepper sheep's milk ricotta gelato. The lengthy wine list focuses on Italy, naturally, and there are also Italian and local beers plus cocktails, including a barrel-aged Negroni.